It has been said that "Banzhang is king, Yiwu is queen." Lao Banzhang has been proclaimed as the "King of Pu-erh" and is probably the most highly sought after Pu-erh in recent years. Every spring, tea aficionados and dealers travel to LaoBanzhang to source this famous tea. The Banzhang region consists of five tribal villages. Lao Banzhang is one of the five and is widely known to produce the best tea. The area is not big and the annual yield from the old trees is far below the demand. As such, being able to source the genuine Lao Banzhang tea is not an easy task. "It is bitter as it enters the mouth and gradually dissolves. Subtle tea fragrance moves through the mouth as threads of hui gan spin around in the throat." This describes the profound experience of tasting Banzhang tea, according to The Art of Tea Magazine. This Lao Banzhang brick is made with 100% first spring picked leaves from Lao Banzhang. Additional measures were applied to ensure the authenticity of the leave source. 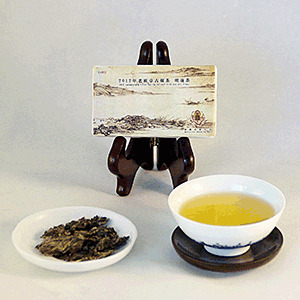 This tea offers you a high level of enjoyment and is a “must have” in your Pu-erh collection. It should be noted that the supply of this tea is very limited.